Has Dinesh Karthik overachieved in the limited chances given to him? 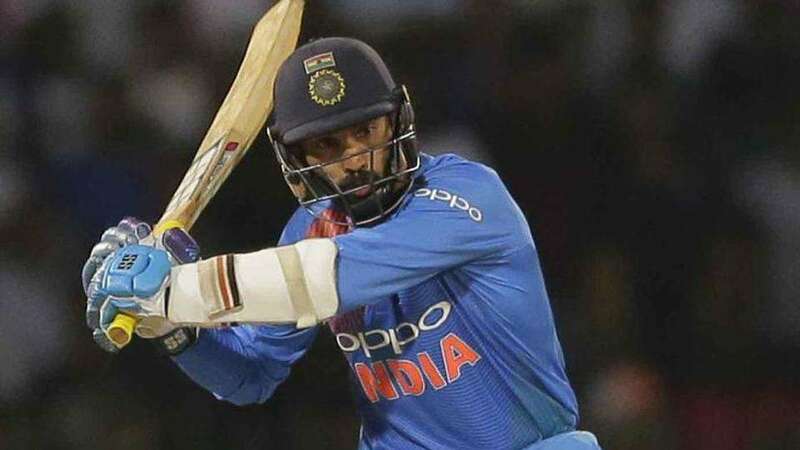 Has Indian cricket been fair to Dinesh Karthik? When Dinesh Karthik arrived in international cricket, none of the present players were around except Yuvraj Singh. Dhoni hadn’t debuted. The old-guards- Sachin, Dravid, Saurav, Laxman and Kumble- formed the key planks of Indian cricket. T20s hadn’t taken birth and Test Cricket was still enjoyed with packed stands. As Dinesh Karthik celebrates his 33rd birthday, MS Dhoni seems fresh as if he is merely a single series old. The likes of Rishabh Pant and Ishan Kishan are holding their breaths from sidelines. T20s have become an everyday affair. And above all- have arguably employed a driven athlete, who seems ever capable to feature in ODIs all throughout the year. There are a multiple realities surrounding Dinesh Karthik’s world, one where a Test appearance last came in 2010 and where Indian cricket hadn’t perhaps decided yet what to do with the right-hander’s talent. Have you ever found a cricketer who, despite a nearly 14-year journey in the sport, hasn’t found a fixed batting position and has still continued without turning bitter? Some are born to entertain. The others, happily endure. Why a cricketer who, only recently upon striking a brilliant (nearly career-saving) 29 off 8 to save India from an embarrassing loss to Bangladesh wasn’t made to feature consistently in the game’s limited overs format is a puzzle that may challenge most nuanced minds. Modern cricket enforces a simple albeit uncomplicated rule. It’s rather an unsaid expression of sorts. You anoint a place for a batsman and he is left to cement himself in there. If he does perform, his team and he gets the credit. If he doesn’t, he’s got no one else to blame. But in Karthik’s case, who does he blame? In fact, can he say that his major employer is cricket’s briefest format where destinies and talents exchange hands as if to indicate a multiple-clause crippled business contract? In 20 of his 67 innings, we made him open in ODIs, and he was only able to collect 504 runs. The alliance didn’t work. At number 3, where he was only settling in the role of a pinch hitter with a rare distinction of knowing where his off stump was, he was removed and placed in suddenly at number 5. This move was akin to finding snowfall during peak summers in India. After all, he had only struck a career-best 79 in ODIs earlier and seemed comfortable in a strike rate of 72. But, he went about uncomplainingly. Then at 5, Karthik scored a further 220 runs from just 9 innings, of which he remained unbeaten on 3 occasions. He scored at a partially low looking 70 but was getting in the groove, scoring at an average of 36, which is when his batting suffered another demotion. Karthik accepted each induced change in his career, with an acceptance to make most of what he possibly could- never sporting a grim face, instead, putting up with a smile. It seems familiar weather will be forecasted ahead. For reasons best known to career-shapers who sit in air-conditioned rooms, with one hand on coffers and the other on a coffee mug, Karthik was also tried at number 6. He played 9 innings here and failed to reach even 200 runs, although he enjoyed a career-best strike of 83 at this position. He was asked to move again to number 7 where we have now got accustomed to seeing the mild-mannered bloke bat in recent times. And it can be said, Indian cricket’s biological dissection of Karthik’s ODI batting career has finally reached a toll, despite the subject surprisingly showing no signs of deterioration. The results, arguably a combination of constant experimentation and Karthik’s own attempts to remain meaningful in an age favouring constant transition have worked. So far, of the 9 innings at his new ‘home’, he’s collected 158 runs and remained unbeaten on 5 occasions. He’s also managed to experience perhaps a new pathbreaking curve at this time; that of honouring the leadership mantle of one of IPL’s most famous teams- KKR. He took the outfit to Playoffs nearly a fortnight ago and throughout IPL 2018, looked in fine knick. How did Dinesh Karthik survive the greatest assault purported on his career, for the lack of a better word, we still don’t know. Here’s what is known about Karthik, which may unite his fans and critics in a universal nod of approval. To his misfortune, he isn’t a star cricketer. His name may not hold the gravitas to fill in stadia even in his native India. You know Dhoni as being a ‘finisher’, you know even Sanju Samson for the famous wristy flick over wide mid-on but you don’t know a signature shot of Karthik. This is when, he blasted the likes of Parnell and Styen along with Tendulkar in playing his most memorable ODI knock of 79 in 2010, an inning at number 3, where it finally seemed India had a cricketer who was ready for the world stage, instead of being a used as a spare wheel for a flat tyre. Interestingly, Karthik has also collected a Test hundred and 7 fifties but was discarded even as the likes of Rohit and on present-form, Rahane are being persisted with. Do you know Karthik’s T20 strike rate? Dinesh Karthik, it could be said, doesn’t seem too bothered about what comes his way. It may have to do with his unbridled joy at being in midst of a competition. You still encounter the rarity of hearing the mind-space of Deep Das Gupta from the commentary box. The earnest smile of MS Dhoni adds a dash of cool to sub-standard, even gloomy news headlines. Yet, having been around since 2004, do we really know Dinesh Karthik all that well? So who’s to be blamed for this scenario? Is it the earnest man himself whose T20 strike rate- 145- is way ahead of Shikhar Dhawan and the likes of Kedar Jadhav and Hardik Pandya included?